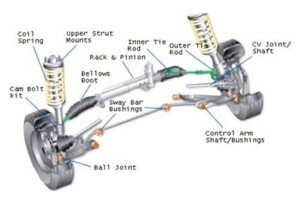 One of the most overlooked areas in today’s motor car is the steering and suspension. And yet the handling is so critical in safety and braking. If the suspension in your car is not functioning to meet the demands of the roads that you are driving on, then you are at risk of an under-performing car. If your car is under-performing, then you do not have any control under dangerous conditions (you can be the greatest race car driver in the world but if your car does not handle, then no skill can save you – as in the tragic death of the great Ayrton Senna). The main emphasis on steering and suspension is to continually keep the tyre on the road. This gives traction. Once the tyre loses contact with the road the steering and braking will under-perform. One problem owner drivers have with their cars is that they get used the deteriorating function of their cars. 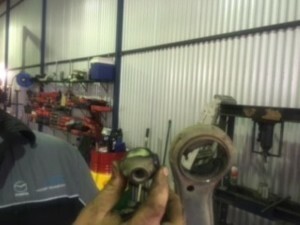 This is why it is critically important to get your car serviced every 10,000 km. At Manny’s Mechanical Repairs we test drive your vehicle, listen to any knocks, creaks , squeals. 1. Check the condition of your tyres and check tyre pressures. 2. Check suspension under load. 3. Check all steering arms. 4. 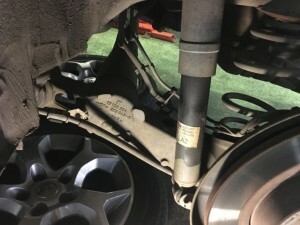 Check sway bar and connecting components. 5. Check spring and ride height. 6. Check shock absorber and macpherson struts. 7. Check suspension bushes for wear and deterioration. 8. Check steering box or rack & pinon for damage or oil leaks. Here we have a left rear shock absorber leaking oil. That requires immediate replacement. This was picked up in a 75,000 km service. Here we have the centre of a main load suspension bush completely broken – the result was a car that was wandering over the road at high speed. To make this worse the owner was a unsuspecting mother of three young children. 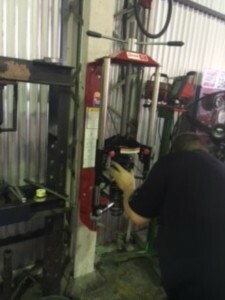 In this picture Ricky is replacing the springs on a 2010 Ford using a heavy duty spring compressor. Here at Manny’s Mechanical Repairs we focus on customer safety and specializing in mechanical excellence to keep our customers safe and ensuring your vehicle is in roadworthy condition at all times.